Is this how you want me to walk? Without guidance, dogs can grow up to develop some rather disagreeable behaviors. Jumping up on people, running off and refusing to return when off leash, eating poop and chewing our belongings to name just a few things that can make a dog hard to live with. So how do we prevent our dogs from growing up ‘out of control’? 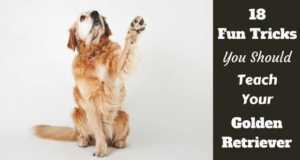 The answer to that is obedience training your Golden Retriever. This article describes what obedience training is, why it’s so important, what basic commands exist and how it benefits both you and your Golden Retriever. 1 What Is Obedience Training? 4 Why Are Some Dogs ‘Disobedient’? Obedience training is a ‘catch-all’ term used in dog training to describe teaching your dog a set of commands to follow so you can have a degree of control over them. 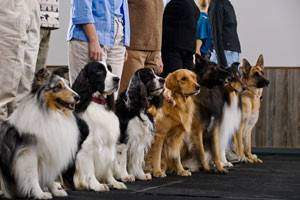 Obedience training covers a whole range of training from the most simple of commands every dog should know (such as ‘sit’ and ‘stay’) right through to very high skilled competitive obedience competitions held by local and national clubs where both dog and handler are judged on precision and performance. But the one thing that all obedience training has in common, and before you can say you have an ‘obedient dog’, is that you must be able to issue your dog a command and they RELIABLY respond and perform that action every time. Obedience training is an essential part of being a responsible owner because without control of your dog they can be a nuisance or danger to others, and a danger to themselves. A nuisance because a dog that chews can destroy precious and expensive belongings. Or one that wanders off into places they shouldn’t go or begs at the table for food is highly annoying. A danger to others because a dog the size of a Golden Retriever that jumps up can easily knock down the young or elderly. And one that chases could potentially knock down a cyclist causing serious injury. And they can be a danger to themselves because they don’t really understand our world and can get into all sorts of trouble such as chasing cats into a busy road. All of these situations can be avoided with well placed commands…as long as your dog is trained to follow them. This is one of the most important reasons why training your Golden Retriever is so important. Obedience training is the way that you safely guide your dog through life, keep others safe, stop your dog being a nuisance and can even potentially save your dog’s life. Regularly training your Golden Retriever has benefits above and beyond being able to guide them safely through life. It’s quality time you and your dog spend together working and succeeding as a team which strengthens the bond between you. It instills in your dog a level of love and respect for you being their leader, somebody they can rely on to ‘take care of things’ so they can generally be more relaxed. There’s no need for them to feel responsible for the pack, you have it all covered. It’s mentally stimulating for your dog. 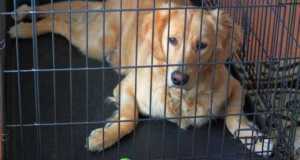 Golden Retrievers are a highly intelligent working breed that need to be challenged and feel useful. If not they become bored and can develop behavior problems. As previously mentioned, obedience training covers many different levels of skill and complexity. There are some advanced commands used in competition that aren’t strictly necessary but can have uses in everyday life or special situations. But only a few very basic commands are necessary to make a difference and for you to have the ability to control your dog. Here is a list of 5 basic commands that EVERY dog should know. The Sit Command – Which puts your Golden into the sitting position. The Down Command – Which puts your dog into a laying down position. Not necessarily laying right down and spread out, but with all four legs (legs, not feet) and their belly touching the floor. The Stay Command – Which should make your dog stay in whatever position they are currently holding, whether that’s standing, sitting or in a ‘down’ position. The Come Command – Also commonly called a ‘recall’, where your dog should come back over to you regardless of what they’re doing. The Heel Command – Used to command a dog to walk nicely on a leash where the dog’s head or shoulders are right beside your leg and the leash is nice and slack. If you can train your Golden to reliably follow just these five basic commands it will grant you very good control of them. You will have the ability to guide them through life safely and guide them through situations where otherwise they could become a nuisance or a hazard. This will ultimately make them more welcome and appreciated in many more places and situations as you have them under control, and so it also improves their variety and quality of life. What is an advanced obedience command? Well, obedient means to comply with an order or request. So really, ANY command is essentially an obedience command. Advanced obedience commands cover those used in high level competition and behaviors we teach as tricks. A few examples are: Roll over, place, figure of 8, drop on recall, sit for exam, take it, leave it, give, scent discrimination, directed retrieves and jumps. But there are many more. I’m not going to go into detail over advanced obedience commands until I’ve fully covered the basics on this site. So for those interested, please visit this article on obedience trials at Wikipedia. Why Are Some Dogs ‘Disobedient’? The number one reason some dogs are disobedient is because the owner hasn’t trained them effectively. This is usually because they haven’t really understood how their dogs mind works when learning and they haven’t undertaken ‘proofing’. Well, it’s the very important last step in training a command before you can truly say that your dog has been trained. Dogs do not ‘generalize’ well. Which means if they learn a command in a specific place or situation, they aren’t easily able to apply their learning to different places and situations. By this I mean that learning ‘sit’ in your living room means they should sit when in your living room. But if they hear that word in your friends living room, it has no meaning to them. They haven’t heard or been trained that command in your friends living room yet. In contrast, humans generalize well. For instance when I was a child and I was told in my dining room not to eat my food with my hands, I understood not to eat my food with my hands anywhere at any time. If I couldn’t generalize well, I might have thought it meant not to eat with my hands in my dining room but if I went to a friend’s house or a restaurant, I’m allowed to eat with my hands there. This is how a dogs mind works. They are very specific and find it hard to generalize. And so we have to go through the process of proofing. Proofing is the act of practicing commands with your Golden in every conceivable type of environment and situation, in the presence of many and varied distractions. Just because your dog knows how to sit in your kitchen, or come to you in your back yard, doesn’t mean they can sit in a busy town center or come to you in a dog park. So you have to go through every step of training in these environments to ‘proof’ their learning of a command. Not taking the time to proof commands in many situations with many distractions around is the number one reason many people find their dogs follow their commands at home, but never once they leave and are out in public. 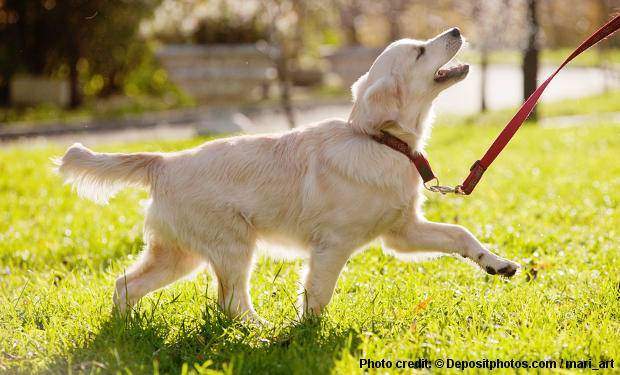 It takes time and patience, but it must be done if you’re to successfully train your Golden. You need to first learn how to train your dog a command and behavior in the quiet and calm of your home where there are no distractions. Then once you’ve successfully trained a command in your home, you need to proof the command by re-training it step by step from the beginning in many different environments. It may seem strange to practice commands in a busy town center or shopping mall, but the results will pay dividends. But not only do you train your Golden in many environments, you also have to proof commands with a variety of distractions around too. A dog may be able to sit and stay in a quiet park, but it’s a different story to do the same when there are 15 screaming children playing football nearby and 2 dogs running around. You should train them with no distractions, then with distractions far away, then move yourselves ever closer so the distractions are stronger. There are many, many other types of environments and distractions we could list (many hundreds) but I’m sure you get the idea. Now, what if you hit a roadblock in your training and you just can’t seem to teach your dog a command or they just won’t obey in a particular situation? It’s a good idea to attend obedience classes. There are many different types and styles of obedience training courses. Puppy classes, those for older dogs. Some just for beginners, others for intermediate to advanced skill levels. Some take place in a businesses premises, others move around to test and train skills in all sorts of environments. They are a very good investment of time and money for not just new, inexperienced owners, but for seasoned pros too for all the social benefits they offer to a dog. They’re good for getting advice on overcoming stumbling blocks in training. There will be highly skilled, experienced professional dog trainers there that can tailor training to a specific problem or behavior and offer alternative training methods if a dog isn’t responding. Such classes are an excellent way to ‘train the trainer’. You will learn proper training techniques and methods from the pros that you can take with you and use for the rest of your life. Classes are excellent for providing your dog opportunities to interact with humans and other dogs on a regular basis, making them a valuable experience for socialization and proofing your training with many distractions. For these reasons, I highly recommend attending at least a few obedience classes to everyone. 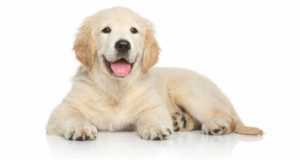 There are some basic tips and guidelines you should follow to make training your Golden Retriever easier, speedier and more successful. 1. Consistency is key: Make sure EVERYBODY uses the same set of commands every single time. If your dog learns ‘Lassie, sit’ and then another time ‘sit down, Lassie’ is used, the dog will be confused. Make sure you and your whole family use the same commands consistently. 2. Be patient and understanding: Your dog doesn’t speak ‘human’. And the way a dog learns is different to us. They aren’t only trying to understand what we want them to do, but also trying to understand us at all in the first place. This will take time. And when they understand a command, proofing takes time. So be patient and understanding. 3. Keep training sessions short and fun: Your Golden loves to work with you, but anything that’s too long and repetitive can get boring for anyone. So always vary the structure of training sessions, and always stop before your dog burns out and loses interest or they may well lose their passion for training. 4. Take things slowly: You have to break a task down into the smallest steps and make it as easy as possible, at home with no distractions the first few times. And only when proofed there can you up the stakes to new locations and add distractions, and only then very slowly. Try to set your dog up to succeed. 5. In the face of failure, take a step or two backwards: If you’re increasing the difficulty of training by adding distractions, distance or duration that a command must be obeyed at and your dog starts to fail, take a few steps back. Make the task easier so they can succeed and earn their rewards before upping the difficulty once more. Many small wins will keep them keen. Many failures will lose their interest. 6. 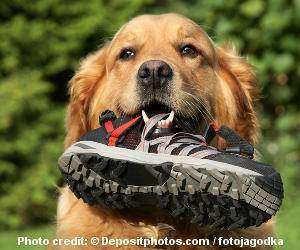 Always end on a good note: Finish every training session with a couple of commands you know your dog will succeed with. This allows them to finish on a happy note, earn praise, a reward and leave the training session with a lasting feeling they’ve done well. You don’t want them to leave training feeling frustrated and like they failed or they will lose their enthusiasm for future. 7. Say a command only once: If you say a command multiple times and your dog doesn’t perform the desired behavior, they’re slowly learning they don’t have to respond. This is especially true for off leash distance commands. Say a command just once and if they don’t respond, wait until you have their undivided attention or they’re back on leash and try again. 8. Using food treats during training is highly effective: This is true for training most breeds, but particularly Golden Retrievers with their unstoppable appetites. You can use food treats as lures to get them into a position and as a reward for doing so afterwards. This is extremely effective. 9. Make sure you phase out food rewards: If you treat your dog every single time, they will only perform a behavior when they want the treat and will feel hard done by if the treat doesn’t come (which isn’t good when you have none on hand.) But if you reward them only occasionally, dogs love the gamble and are motivated to work for a treat that comes now and then. So once your dog has learnt a behavior, only reward with food randomly or it will lose its power. Eventually you want to phase out food rewards altogether. 10. Timing is everything: You have to praise and reward your dog the exact instant they offer the behavior you’ve asked for if you want them to make the connection between a command and a behavior. The more precise you are with this, the quicker they will learn. 11. You have to practice regularly: If your dog learns a command and you want them to remember it, you have to practice it regularly. Dogs forget their training and skills unless you refresh them often. Obedience training requires quite an investment of time of effort, even to get just the basics right. But this is part of being a responsible owner and is hopefully something you weighed into your decision before you ever got your Golden. Basic obedience commands teach essential skills a dog needs to live in harmony with a human family. And they allow you to keep your dog and everyone around them safe by issuing careful direction to your dog. Obedience training also provides your dog with a sense of usefulness and purpose, a sense of having done meaningful work and it exercises their minds which is important for an intelligent dog like a Golden Retriever. Training improves the lives of both you and your dog, strengthens your relationship with your dog and if done correctly is a lot of fun to boot. 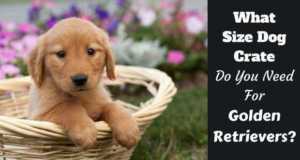 Golden Retriever Obedience training is essential, it’s not really an option. Next: How Much Water Does A Golden Retriever Need? It’s best to google ‘dog trainer in ‘ and see what comes up, or possibly ask your vet as they will likely have knowledge of some local professionals.